Amidst the seemingly constant slew of new hotels opening in London, are a number of impressive revamps and relaunches amongst the capital’s existing properties. 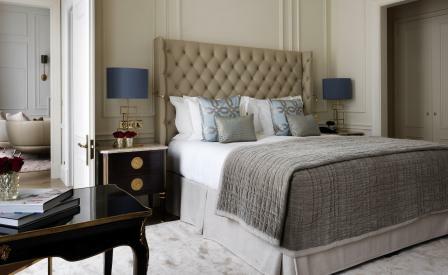 One such re-opening is The Kensington, an iconic townhouse hotel in the city’s royal borough, which has been given a thorough revamp. Part of The Doyle Collection, the hotel follows the group’s ethos of connecting properties to their locale, now more so than ever with the redesign of its individually decorated 126 rooms and 14 suites. This includes the locally-named and totally transformed 753 sq ft Brompton Suite, where original artworks mingle with herringbone wood flooring, 1960’s table lamps and remarkable views of the area in a space designed by Emily Brady of Brady Williams Studios of London. At ground level, The Doyle Collection’s Chairman Bernie Gallagher and the group’s design team have applied a clean and contemporary aesthetic against the building’s heritage features. Three additional areas have been redesigned by the East London design collective Alexander Waterworth, who have lined spaces like the book-filled Library with elegant jewel-toned furniture and contemporary art which revel in streams of natural light courtesy of large bay windows. The hotel’s restaurant, Town House, is led by chef Steve Gibbs and offers a menu based around locally-sourced ingredients, while the revamped Drawing Room, with its gluten-free offerings and freshly-made juices by The Juicery is the place to see and be seen for both health conscious guests and local yummy mummies.